In the month of July I spent a few days on home turf in Toronto and then I headed south to New Orleans, to spend a few weeks housesitting, hanging with friends and surviving the sweltering steamy heat of the southern city. 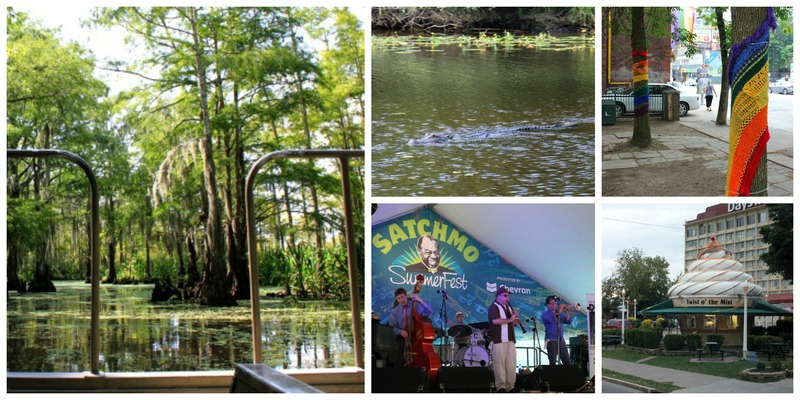 After discovering that yarn bombing had come to my Toronto neighbourhood ( thanks to some local creative types for brightening up the park near the community centre) I went south to New Orleans – to see my friends perform at Satchmo Summerfest and to do something I’ve never done before: go to the swamp, and spotted a Louisiana alligator. On my return to Canada, I was stuck in traffic and got go very slowly by one of the fab tourist buildings of Niagara Falls, New York – the Twist o’ the Mist, an ice cream parlour. July was a fun month of being a tourist. Want to see more of Project 13? Check out my Flickr page.